Please fill out the form below with your question and we will reply as promptly as possible. Place your feet in the middle 2 Easy Grip Loops separated by one seal. Hold the ends of the CLX in each hand with either an open hand or closed hand grip. Spread your feet to hip width apart and assume a semi-squat position. From your semi-squatted position jump upward while extending your arms against the CLX. Tip: Be sure to land with your knees in line with your shoulders and hips and do not let your knees buckle inward. *Do not exceed 300% elongation. Some exercises may require longer lengths of CLX. Stay in the Loop! 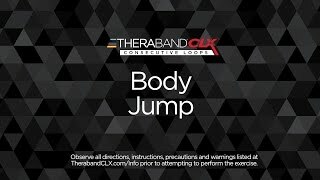 Be the first to get Theraband CLX updates!